Hey guys today’s youtube video & post is a very personal one and is very close to my heart. 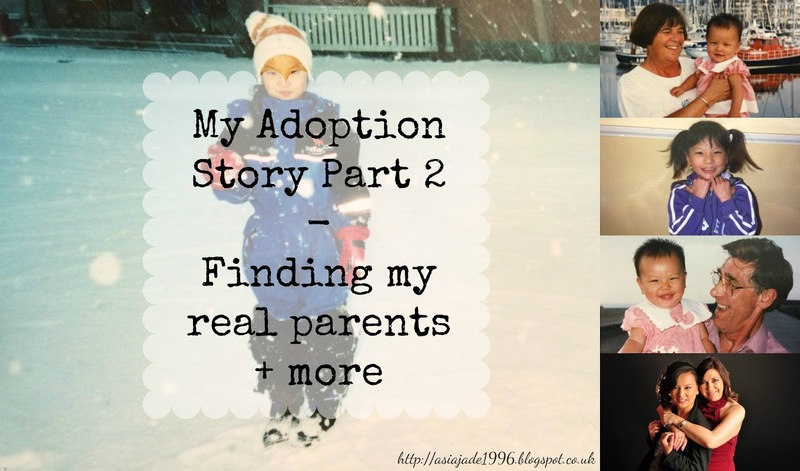 It’s the second part to my adoption story if you haven’t seen the first part then I’ve put the links down below. I really hope you enjoy finding out more about my story if you have any questions feel free to ask them!! If you liked this video please give it a THUMBS UP and make sure to SUBSCRIBE. Hey guys so if you don’t already know then I was adopted when I was 10 months old from China. I don’t know any of my real family and in today’s video I will be discussing if I would ever like to find them. The truth is not really I know that many people would like to find their real parents if they have been adopted or fostered. However I have my reasons for not wanting to find them. I guess the only real reason that I would want to find them is because I would like to see who I look like most so that’s not really a valid enough reason to begin the search now is it? I also have such a loving family already that finding my real family could confuse my a lot and create many complications within my life. As well as this because I was adopted from China it would be extremely hard to find my real parents as Chinese people are the most populated in the world. Not to mention the cost, time and effort it would take along with the possibility of them not even living in China or being dead. I am also very realistic when it comes to this topic as I think about it daily so I know that the possibility of them not wanting me could be true as I was put up for adoption in the first place. However I also know that I could have been put up for adoption for many other reasons such as the one child policy which was very popular in China at that time. In addition to this something may have happened like my mum could have died at birth and my dad didn’t want to raise a baby on his own all of this could be possible. If I ever did want to find them later on in life I would wait until I’m stable enough so that means I have a good job, a supportive husband & family (I already have this) and I am most importantly emotionally ready. I guess if you are not adopted or don’t have any friends that are then you won’t know how emotionally stressful it can be at times. The thing that weighs on everybody’s mind when they are adopted is the fear of rejection which could happen. Although it’s easy for people to say it would be simple for me to find my real parents. It won’t. I mean first of all China at that time were mainly paper based which means that all of my records will probably be lost by now. Secondly the only real way of finding if someone was really related to me would be through DNA. I can’t go around the whole of china asking people to take a DNA test now can I it would be unrealistic, costly and pointless. The whole thing would cost thousands as there would be many stages to finding them. This slightly puts me off as there’s no point in my opinion in wasting that much money to get rejected or to find out that they are dead. I know that I probably sound selfish as they could want to find me but at the end of the day I was adopted so ultimately it’s my decision. I don’t have that much of an urge to find them as other people do I’m quite happy with my family life at the moment I have a loving family. So that’s the end of the second part in my adoption series if you would like me to do a third part then please let me know. I hope you liked understanding my thoughts and feelings on my adoption. I’d also like to say a massive thank you to my mum for allowing me to upload this as it’s personal to her too. "Thank You Give Away | (CLOSED)"
"Wishlist | I Were To Spend Money #4 – South Beach"